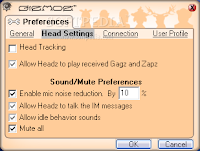 Gizmoz Talking Headz is an extremely humoristic innovative Plug-in for all the leading Instant Messengers. Now for the first time you can communicate by fun amusing believable 3D personal Talking Headz, which are animated by emotions, your own text to speech or by your very own voice. - Same user name and account for both your Gizmoz.com and your Gizmoz client.